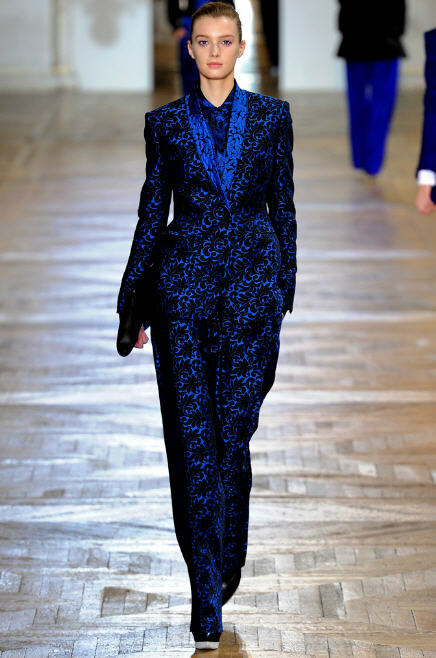 Stella McCartney just made Vanity Fair’s 2012 International Best Dressed list, as well as creating the performance kit for Team Great Britain in the London 2012 Olympics, so she is having quite a fantastic month! While at the UK’s Creative Industries Reception in London, she wore a head-to-toe look from her own Fall 2012 collection including a Wool Brocade Jacquard Jacket, a Wool Jacquard and Shiny Silk Shirt, matching pants, and Croco Print Pointed Pumps. A great menswear-inspired look, given some life for Fall in an amazing print! Her jacket features a single front button closure, for a very sleek look. Her shirt boasts the same print and a concealed front button closure. Last, but not least are her “It” pumps which feature a white rubber sole and sky-high 5.5″ heels.